Is a Chromebook touchscreen worth $100? Acer's C720P Chromebook packs speed, a solid keyboard and endurance in an attractive and lightweight package. But is a touchscreen worth a $100 price hike? Since their introduction several years ago, Chromebooks have redefined our understanding of affordable laptops. They're the new netbooks, using Google's operating system based on its Chrome browser, pared down to the bare necessities – low-power processors, low-resolution screens and a minimum amount of memory and storage. By stripping the laptops of extraneous features, manufacturers can keep their price down to $250 or less. As a result, however, many Chromebooks seem almost indistinguishable from one another. Because they lack defining features and are so affordable, it can be difficult to choose one Chromebook over another. Acer aims to change that with the C720P Chromebook. This 11-inch laptop sports a fast Intel Celeron processor, a comfortable keyboard and impressive battery life, all wrapped in an attractive and lightweight chassis. But the C720P's standout feature is its touchscreen – in fact, it's one of the few Chromebooks to use a touch panel. Of course, that begs the question: Is touch control on Chrome worth spending an extra $100? 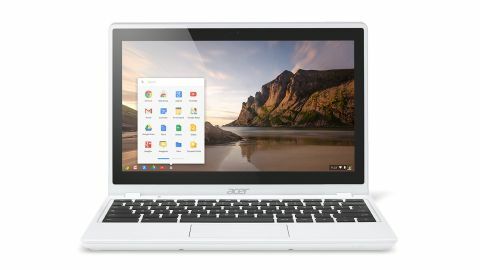 With the C720P, Acer hasn't substantively updated the design of its lauded, $200 C720 Chromebook. Like its predecessor, the C720P still features a slim, all-plastic design that feels surprisingly sturdy and light. My review unit sported Acer's Moonstone White finish that proved resistant to smudges – Acer also offers the C720P in a Granite Gray, too. Unsurprisingly, the C720P isn't particularly flashy. Small Acer and Chrome logos on the left side of the lid are the only adornments on an otherwise plain shell. One noticeable difference is the weight of this machine. Where the C720 clocks in at a respectable 2.76 pounds, the C720P weighs 2.97 pounds. Both machines are substantially beefier than the HP Chromebook 11 and Asus X102BA (a budget Windows 8 laptop), which weigh 2.29 pounds and 2.4 pounds, respectively. Nevertheless, the C720P isn't much heavier than even the slimmest Ultrabook. When I carried the Chromebook and its tiny power adapter around Manhattan in my bag, I barely noticed the weight. The port selection remains the same here: HDMI, one USB 3.0 port and a headphone/mic jack on the left side of the machine, and one USB 2.0 port and SD card reader on the right. USB peripherals will work correctly as long as they don't require software installation. When I plugged in a WD My Passport external drive, for instance, I could browse the files almost instantly, but Windows-specific features, like WD Drive Utilities, can't run on Google's OS. Like its predecessor, the C720P houses a dual-core, 1.4GHz Intel Celeron 2955U processor with a 2MB cache, 2GB of DDR3 RAM, and Intel HD Graphics with 128MB of RAM. That's plenty of power for a notebook that's designed solely to browse the web. Acer also upped the storage capacity from a 16GB solid-state drive to a 32GB SSD. While this might not sound like a major improvement, you'll be glad to have the extra storage when you download apps or work on documents offline. HP's Chromebook 11 packs a weaker dual-core Exynos ARM processor, 2GB of RAM and 16GB of flash storage (though, in truth, that machine performed smoothly during everyday use). The X102BA uses a 1GHz AMD Temash APU, 4GB of RAM and a slower 500GB mechanical hard drive – an understandable cost-saving choice given Windows' reliance on local storage. With only a 32GB SSD on the C720P, you'll rely heavily on online storage and services. Thankfully, Google provides 100GB of free Google Drive cloud storage with the purchase of the C720P, as well as a 30-day trial of Google Play Music All Access (Google's answer to Spotify). You can store anything in Google Drive, though you can only create documents, presentations, spreadsheets, forms or drawings. There's just one drawback: While you can edit Microsoft Office files after they've been converted into Google Drive format, some features such as comments and tracked changes in programs like Word don't appear in the Drive version. This limitation will prove frustrating if your classmates or colleagues frequently use Word or Excel.